Full disclosure: Sea-to-Summit sent me their ultralight hammock, tarp, and gear hammock to review this summer. I loved the gear so much I purchased the pro hammock for myself, and decided to add my review here. This review represents one of the few hammocks I’ve purchased over the years and wasn’t a solicited review. I’ll let that speak for itself. The Sea-to-Summit Pro Hammock Single rounds out their hanging options. It’s a full-size hammock made from a single panel of fabric, similar to the ultralight. The difference is in the larger dimensions and more robust and comfortable fabric. Like the ultralight, the Pro Hammock has a Cordura® Bishop Bag compression style stuff sack attached to one of the ends. The compression straps really pack it into a small size. The hammock body uses soft, 70-denier ripstop nylon with a sewn webbing loop to gather the ends. The end loops are sewn with a high-strength plated steel buckles. The proprietary suspension buckles are designed to be used with their suspension system and straps; however, you can bypass the clip and use other systems, or cut off and replace it. The side hems are generous and can easily fit elastic ribbon, for those who want to add an after-market DIY Knotty Mod. However, the Single model doesn’t really need that because there is no extra floppy fabric to worry about, thanks to the right dimensions on the hammock. The Pro Hammock comes in both a Single and Double variety, like many open, gathered-end hammocks. I typically recommend that folks “upgrade” to the double because the extra size is more comfortable. However, since Sea-to-Summit has designed their hammocks with optimal dimensions, the Single is actually a great option. The 10 x 5 ft (3 x 1.5 m) size is ideal to achieve a diagonal lay without any extra fabric flopping in my face. Sea-to-Summit has really perfected compression stuff sacks. The lid is attached on one side, making it easy to pop on and off without getting the straps tangled or twisted. The catenary cut edges help keep the fabric taut when it’s tightened, and the buckles and thin webbing are perfectly paired to achieve the right balance of grip and adjustability. I can confirm that the Pro Hammock uses the same fabric as their gear hammock. It’s a nice fabric that has a soft hand. 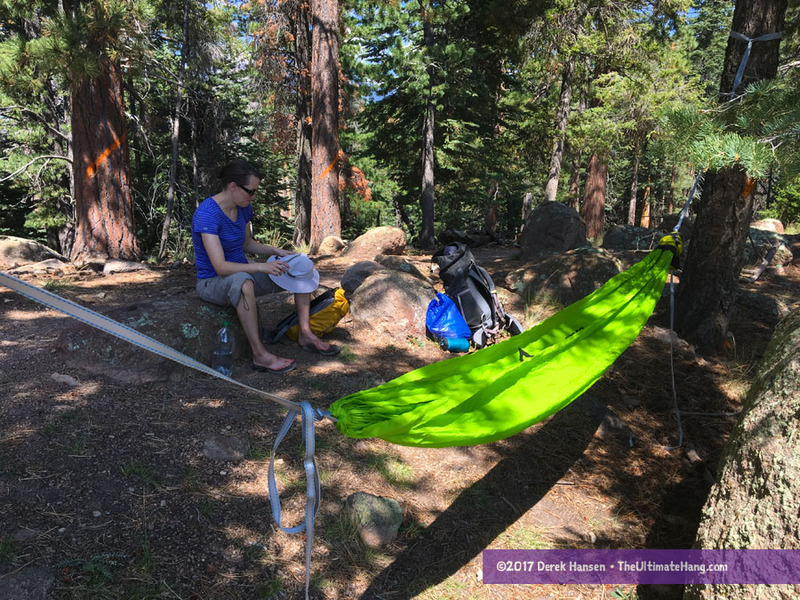 The hammock is one of the few I’ve tested that has the right balance of features and simplicity. The single panel body makes the lay much more comfortable since there are no seams on my back. The dimensions are spot on for my height and lay preference. The webbing loops gathering the ends are also a nice touch, allowing the fabric to slide, preventing the edges from being too taut. The only negative is the integrated suspension clips. This is only really a problem for folks like me who like to tinker with different suspension options. The proprietary webbing and suspension that Sea-to-Summit offers is actually quite ingenious and works well, but if you’re trying to save a little weight or have a suspension preference, it poses a small DIY challenge. Last, but probably less important, is that the Cordura stuff sack color clashes a little with the bright green hammock. I almost wish they were either the same color/fabric or contrasting colors. Aesthetics ♥ ♥ ♥ ♥ ♥ Comes in your choice of bright Lime, Red, and Blue varieties. Price and Value ♥ ♥ ♥ ♥ ♥ Great price for the size and value of the hammock. I would be interested to hear your side by side comparision with the Therm-a-Rest Slacker Hammock you’ve also tested. Just purchased the last one by myself, but was not able yet to use it in-the-field. More color options is a definitive plus, I personally prefere more decent or discrete ones, whereas ‘lime-red-blue’ is looking for attention (in the woods). When camping, a good tarp and site selection can mask a hammock’s color, and if you use an under quilt, it’s all but disappeared. I agree that muted colors are ideal for camping. The Slacker is also a great option. I think Therm-a-Rest has a softer, more cotton-like hand. Your rating doesn’t show up correctly in your e-mails. It shows up as five hearts in all categories no matter the actual rating is. Thanks! I noticed that as well today. I’ll see what I can do to fix that. The good news is that the book is out! I just need to let folks know! Hi Derek, bought your book and am loving it, excellent source of information and the illustrations really help explain things. I am wondering about the Sea to Summit hammock and the size. You say that it fits you well, but am wondering how big you are and whether this will fit me and a friend who is considering a hammock. I am 183cm (6ft) and my friend is around 192cm (6ft4). Thanks! I’m 5’10” (70 in / 178 cm). I think you’ll be at the comfort limit; too small for your friend. I’d get a longer hammock. I’m new to hammock camping and not very tall (170cm). You’ll fit fine in this hammock. It’s a great option, but you may want bug protection?